Cory Conacher is doing everything he normally does. The Syracuse Crunch forward is averaging roughly a point per game. He is dependable in all situations. And despite being listed at 5-8, he's constantly in players' faces and drawing the ire of the competition. But five years removed from winning the AHL's Rookie of the Year award, Conacher is looking to become more of a leader as he wears the alternate captain's A with the Crunch. "I've been working hard on and off the ice," Conacher said. "I try to show by example rather than talk as much. That's the way I lead. I work hard on the ice and I work hard off the ice, so that's hopefully getting to the young guys." Cory Conacher knew he was on the bubble. After being one of the last players cut by the Tampa Bay Lightning during training camp, the forward has gotten off to a fast start with the Syracuse Crunch. 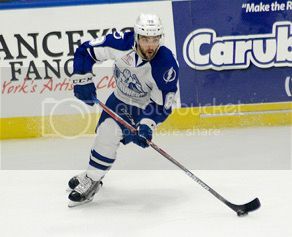 Conacher earned his first call-up and played one game Saturday, but was returned to the Crunch Sunday. Conacher is keeping a positive attitude as he continues to work towards another call-up. TAMPA BAY – The Tampa Bay Lightning have signed forward Cory Conacher to a one-year, one-way contract worth $575,000, vice president and general manager Steve Yzerman announced today. Conacher, 26, has skated in 141 career NHL games with three different teams over three seasons, posting 19 goals and 58 points to go along with 84 penalty minutes. He had his most successful NHL stint with the Bolts during the 2012-13 season, recording nine goals and 24 points in 35 games. In his first six NHL games while playing for the Lightning, Conacher collected five goals and 12 points. Conacher was traded by the Lightning, along with a 2013 fourth-round draft pick, to the Ottawa Senators for goaltender Ben Bishop on April 3, 2013. The Burlington, Ontario native played in 48 games with Bern SC of the Swiss-A league during the 2015-16 season, collecting a team-best 22 goals and 52 points in his first season with the club. Conacher also registered five goals and nine points in 14 playoff games, helping Bern win the National League A title. Last season, he also played for Team Canada at the Spengler Cup and helped them capture the title while be named to the tournament’s all-star team. The 5-foot-8, 182-pound forward has appeared in 166 career American Hockey League games, recording 67 goals and 153 points. Conacher set career highs during the 2011-12 AHL season, posting 39 goals and 80 points in 75 games with the Norfolk Admirals, the Lightning’s top affiliate. That season, Conacher led the Admirals to a Calder Cup Championship and was awarded the Les Cunningham Award as the AHL’s regular season MVP. Conacher went undrafted and originally signed as a free agent with the Bolts on March 3, 2012. Mathieu Garon allowed 2 goals on 25 shots and was 1 for 2 in the shootout for the SOL. He got outdueled badly by Markstrom, and Lightning fans have to be cursing the day Lindback got his high ankle sprain. The Lightning completely dominated large swaths of this game and deserved better than to only get 1 point out of it. It's damned hard to put together a winning streak when you're surrendering a soft goal or two every game, and the Lightning desperately need a winning streak. Mike Angelidis was 43% on draws in 7:22. Alex Killorn had a goal and was +1 with 4 shots in 23:20. He's so money. Andrej Sustr was +1 with 1 shot in 8:19. Officially 2 giveaways. That'll get your ice time down in single digit minutes as a rookie. Tyler Johnson had 1 shot, 1 hit, and was 58% on draws in 16:53. Ondrej Palat was +1 with 2 shots and 3 hits in 11:39. Radko Gudas had a fight, 2 shots, 1 hit, and 1 blocked shot in 11:55. Cory Conacher played 14:04 in the game.